A glittering landscape of twenty-five speculative stories that challenge oppression and envision new futures for America—from N. K. Jemisin, Charles Yu, Jamie Ford, G. Willow Wilson, Charlie Jane Anders, Hugh Howey, and more. In these tumultuous times, in our deeply divided country, many people are angry, frightened, and hurting. Knowing that imagining a brighter tomorrow has always been an act of resistance, editors Victor LaValle and John Joseph Adams invited an extraordinarily talented group of writers to share stories that explore new forms of freedom, love, and justice. They asked for narratives that would challenge oppressive American myths, release us from the chokehold of our history, and give us new futures to believe in. They also asked that the stories be badass. The result is this spectacular collection of twenty-five tales that blend the dark and the light, the dystopian and the utopian. These tales are vivid with struggle and hardship—whether it’s the othered and the terrorized, or dragonriders and covert commandos—but these characters don’t flee, they fight. 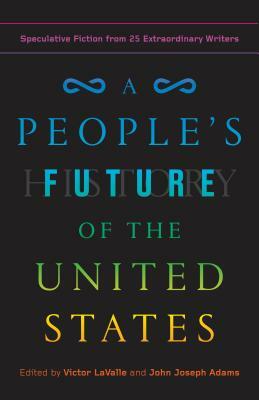 Thrilling, inspiring, and a sheer joy to read, A People’s Future of the United States is a gift for anyone who believes in our power to dream a just world. Victor LaValle is the author of seven works of fiction: four novels, two novellas, and a collection of short stories. His novels have been included in best-of-the-year lists by The New York Times Book Review, Los Angeles Times, The Washington Post, Chicago Tribune, The Nation, and Publishers Weekly, among others. He has been the recipient of a Guggenheim Fellowship, an American Book Award, the Shirley Jackson Award, and the Key to Southeast Queens. He lives in New York City with his wife and kids and teaches at Columbia University. John Joseph Adams is the editor of John Joseph Adams Books, a science fiction and fantasy imprint of Houghton Mifflin Harcourt. He is also the series editor of Best American Science Fiction and Fantasy, as well as the bestselling editor of more than thirty anthologies, including Wastelands, The Living Dead, and The Apocalypse Triptych. Adams is also the editor and publisher of the magazines Nightmare and the Hugo Award–winning Lightspeed, and is a producer for Wired’s The Geek’s Guide to the Galaxy podcast.